The Most Powerful and Versatile DR® Powerwagon Ever! 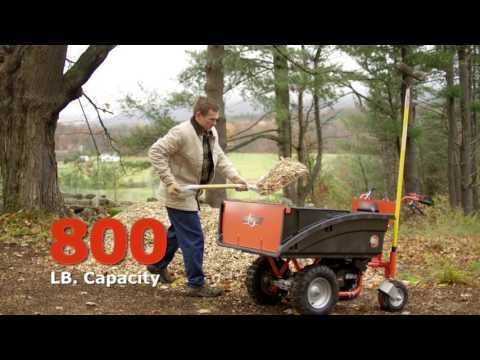 The PRO-XL has the power to haul up to 800 pounds (8.0 cu. ft) with ease! A battery powered actuator lets you unload with the push of a button! Easily converts to a flatbed for carrying long or stackable loads! The PRO-XL model is fully loaded to offer the ultimate ease of use and performance. It's a "go anywhere" powered hauler that you can use in all sorts of areas where you could never take a trailer. It turns on a dime so you can navigate nimbly in highly landscaped areas of your property, and it's built for traversing rugged terrain. The Powerwagon offers all the convenience of a wheelbarrow or garden cart–but with far more capacity and none of the hassle or backache! With the push of a button, a powered Actuator tilts the cargo bed of the PRO-XL for unloading. The steep 60° dump angle empties the bed thoroughly, minimizing the need for raking out materials. The PRO-XL model converts to a flatbed configuration in less than ten minutes, greatly expanding your range of uses. The flatbed is ideal for carrying long or stackable loads like lumber, feed bags, cinderblocks, furniture...you name it! 3 forward speeds and powered reverse let you match your travel speed to your walking pace and maneuver in tight spaces. MUCH More Maneuverable than ANY Trailer! The two rear wheels rotate 360° giving the Powerwagon a very tight turning radius. This means you can go into all kinds of spaces you could never take a trailer...through gateways and barn doors, into wooded areas, on narrow trails, etc. A powerful hand-actuated disc brake lets you check the speed of a fully loaded cargo bed when operating on slopes. The brake lever is also lockable to keep the machine in place when not in use, and to add stability during loading or unloading. With 8.75 foot pounds of torque (190 cc) this engine will power loads of up to 800 lbs with ease. With turn-key electric starting, it features a debris management system that protects the engine from whatever you kick up while you’re cutting. This wagon does a great job the only issue I have is the gas tank is so small I have to fill it up every third day that is a pain in the a!! I really like my power wagon. It’s a big help around my farm! I’m getting a little older and pushing those manual wheelbarrows around all day was getting old. I really like and have gotten good service out of all my purchases. I also have a backhoe and field mower. So far, the Powerwagon has really saved my back moving gravel and mulch for landscaping around my property. It's great for areas where I can't get a tractor and loader. No complaints. The machine, awesome. great engine, great hydraulic lift. However, the orange gate set up is extremely weak. If you load shifts while traveling downhill, the tiny molded plastic tab breaks extremely easy. I am having a steel box made to replace the upper section which will solve this issue. We use this machine for places we can't get a bobcat into so we are rough on it. I recommend it. Just be aware that the gate is the weak point here. Have had the product for about a month now. Use it every day.don't know how I did with out one.great for all types of hauling,both large and small.I live on a farm so there is no telling what I will be doing next.Ilove this piece of equipment it will do what ever you have in mind.The only handy caps, 2 ground clearance. and quite tipsy on hills.nothing you can't work with,being careful as the MANUAL STATES! Nice concept, but the product quality is not what I expected from DR.
1. When I received the powerwagon it was assembled by DR incorrectly. I had to take the wagon apart and correct DR's mistake before I could put the pieces together. 2. I got a stone caught in the pulley system. Why isn't there some time of screen to keep trash out of the pulley system? To fix it I had to take the bottom plate off, and the nuts were in a very awkward place. This is my 4th major product from DR and it's the worst. The other 3 (2 brush mowers and a PTO chipper) worked great. I wish I hadn't bought this powerwagon. Maybe DR has fixed their problems with this power wagon by now. This product I rate as average. The controls, engine,and power dump all work fine. This machine needs positraction and a higher clearence underneath. Many times one tire will start to spin then you end up getting stuck because the other is doing nothing. The dump cart needs to be beefed up too. The orange gate is heavy duty but the plastic that holds it in place is pretty whimpy, yes mine has already broken. Received the crate and put it together, only issue was the actuating dump arm didn't move. Contacted customer service and a new one is being sent. Used it yesterday for the first time to move six loads of concrete debris (each trip approx. 360 FT). Based on today's performance, I have a number of future personal landscaping and maintenance projects that this wagon will assist me in accomplishing. Only recommendation, install or sell tie down attachments for trailer transportation purposes. I got a head of myself! I got ahead of myself! Love my new powerwagon in almost every way! Dissapointed that by the 3rd use the exterior tabs that hold the tailgate on have broken off. I just sent an email to customer service regarding this snd hope for quick resolution. I have only used my machine a few times, but I already know it is one of the best purchases I have ever made. Not sure how I lived without it for so many years! It has already saved so much time, and more importantly it has saved me from aches and pains. Worth every penny. I bought the Pro-XL for use on our farm complex by the landscaper. I saw him carrying deco rock and bark and supplies on his shoulders in 5 gal buckets and a wobbly wheelbarrow in hard to get to spots around shrubs and through narrow gates. He said this is like having a couple helping hands and it doesn't even need a break lol! Talk about the neatest toy made for us oldies. Starts right up and takes loads anywhere we want then dumps the dumpable stuff in a second. My aching back thanks you! Best thing to come down the pike in a long time! This my second Power Wagon,I should be good for another 20 years now. The power dump is great. I bought this unit since I'm getting older and loosing the strength I once had. This wagon is a tremendous help to me. No more pushing and pulling that was getting my back to go out. It makes my yard work so much easier and do-able. I know its a lot of money but now even my brothers want to borrow this unit to move their firewood around! Im very lucky to have found this unit. I highly recommend it! My best yard and garden purchase ever! This wagon is wonderful. I use it to carry items into my yard and garden that is now off limits to tractor and other larger equipment. Was a snap to assemble and I use almost daily in the garden, the yard and the barn. Very happy with the DR Powerwagon, I have no complaints and only suggestions for improvements. The cargo bed is bolted on and requires the removal of 4 bolts to attach the flat bed and then the bolts have to be re-tightened. Having worked with tractors, I would have expected a lynch pin system for a quick change similar to a 3 point hitch. The Electrical system has no charging system. Given the way you use a Powerwagon, with numerous starts and stops a alternator couldn't keep up with the electrical demands. I would like to see a socket on the Wagon that accepts a electrical cord plug like most electric snowblowers have. Instead of continually disconnecting the battery and hooking up a charger. I would definitely recommend the Powerwagon to a friend. Just started using it I can get into areas of my yard that are not accessible to larger equipment. Great for moving my firewood and o these chores great machine! Love it, can't wait for things to dry up so I can use it in my yard & garden. Bought my 1st Power Wagon 27 years ago. Maybe it was 28 years? Hauled hundreds of loads of fire wood, rocks, cinder blocks, and dirt, all year around. Four or five inches of snow, not a problem. The DR Power Wagon is no toy! Well, I did enjoy using it. I overloaded it. Didn’t care! It had a job to do, it was going to do it! It’s still going strong. It’s still in fine condition. Take that! And It’s going to a new home. I’m betting they will use it for many years still. Spotted this new improved feature packed model. Well, the wife did. Electric start and power lift, sold her. It’s shorter, has more power, heavier load capacity, improved maneuverability and feels really solid. That’s what I like. My first use for this Power Wagons was to haul all my heavy gear (several 20 foot log chains and four ton come-a-long, plus chain saw, etcetera, to winch down a large tree.) back to the timber over spring time wet ground, with stability without big ruts. Hate big ruts. Q.What happens if I hit a rock? A.Thank you for contacting us regarding the DR Power Wagon. There's a 9 gauge plate under the frame that protects the machine from any damage. With the aggressive tires, the unit will pull itself up and over most obstacles. Please feel free to contact us if you have any other questions. Q.How fast will this go? A.The DR Power Wagon has three (3) forward gears and one (1) reverse. Here are the speeds: 1.3 MPH in 1st gear, 2.4 MPH in 2nd gear, 3.7 MPH in 3rd gear, and 1.4 MPH in reverse. Q.Will the tool holders fit on this model? A.Thank you for your question. The tool holders will fit on this model. You will receive two tool holders that are perfect for carrying shovels and rakes. Q.Our grades are 15 18 degrees. Will this product work on those slopes? A.Thank you for contacting us. The Power Wagon is rated for slopes up to a 15-degree grade. It is not recommended for use on anything that exceeds that. This is for the safety of you as the operator as well as the machine. Please feel free to contact us if you have any questions. Q.Does this machine have a trailer hitch option? A.Thank you for contacting us. 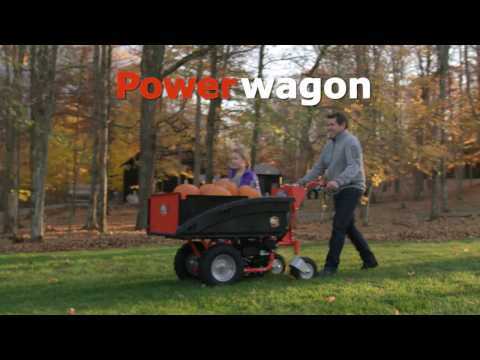 The Power Wagon is designed to be used as a self-propelled unit, not to be towed. There is not a tow hitch. Please feel free to contact us if you have any other questions.